Well jesus, now I have to write one. Some guy decided to give this an 1/5, for some unfathomable reason I can't discern, so now I have to give it a great rating to balance it out. Thanks dude. Really though, while the name is, let's be honest, a little dumb, what who cares about a name? What matters is the show. And thankfully, the show is good. At least, so far. I sorta dabbled a bit in the first Wagnaria, I thought it was cute. This seems to be a... spin off..? I guess? A sequel? I dunno. But I liked it. The characters, and there's a lot of them, seem likeable. Granted, we only got like 30 seconds with the chefs, but I think that'll be remedied later. The main guy serves as a good comedic foil to the more "out there" employees. I say watch it. I promise that 1/5 rating is WAY off. First of all, season 3 already came out. If this was a sequel, it would be season 4. Also, the story was basically concluded at the end of season 3, it would be pointless to have more content. This is a fresh start. I loved Working!! for it's wacky characters, awkward humor, relatable setting, and sprinkles of rom com early on that gradually became the spearhead of the story. I'm glad the studio decided to animate this story as well. It's refreshing to have new characters and a new story in a familiar setting that I know and love. Working!! made my top ten anime and I am very excited to see what WWW.Working!! has in store for us. PS If anyone was wondering, apparently this restaurant is a branch in the same chain as the Wagnaria from the previous series. So everything that happens in this series is still canon, it's in the same world, different restaurant. It's a good comedy, but the characters are far sillier and less realistic than the original, making it more of a gag comedy anime than a daily life anime with some comedy. It's good for what it is, but not great, as I feel some of the characters are too weird or too forced, and make it feel a bit cheap. Watch it for the gag comedy, but don't expect a story or characters as deep and realistic as the original. This is an anime adaptation of the ORIGINAL webcomic that gave birth to the serialized manga which previously got adapted for anime and got three fabulous seasons. The two series happen at the same time in the same world, just in another branch of the Wagnaria restaurant chain with different people. I must say it feels weird to have such a familiar setting but with different characters, even more so when you got to know the previous ones as much as we did with the other series. I will stop myself from judging them before getting to know them though. It's hard, as they all have quirks, and it may be hard to remember how weird the other characters were at first too... but I'm sure these will have their great moments too, as it's from the same author, and I chose to thrust her. I wonder if we'll see more cameo? So right now, that review is more "informative" on the context of that new series, but as we get to know the characters better and I get a better idea of the quality of this show compared to the old one, I'll update this to be more of a real review. I also restraint myself from a perfect score right now, but my hopes are high. Has the potential to be funny, currently lacking. This is just a review of episode one, this does not apply to the whole series. 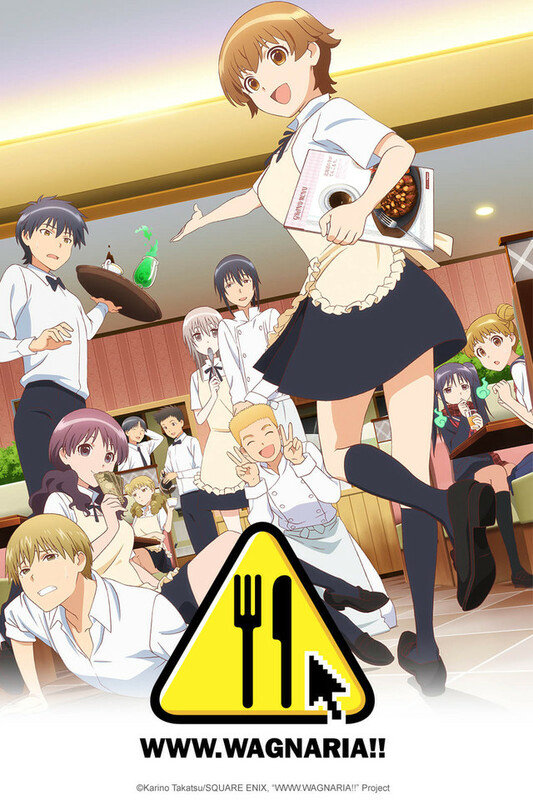 The premise is pretty basic, a boy gets a job at a restaurant full of wacky people. This can be a really funny slice of life if done properly. A restaurant is less limited than a high school slice of life, giving this more humorous potential. The first episode seems to lack. It is all over the place, and doesn't really have any focus. Several jokes while funny, go absolutely nowhere, and many of the characters are bland. It seems likely the show will get better later on. td;lr - Could be a really funny show, needs improvement. Still Wagnaria! Just a little bit overstaffed. While this gives us the same formula as the original Wagnaria series, the problem with this one is that it's trying to outdo the original in a way that's not as charming, namely, throwing way too many characters at us at once. The original Wagnaria had a pretty big cast too, but it was organized in a way that you could keep track. The Takanashi family wasn't seen all the time and didn't go to the restaurant en mass (Typically you'd see Kozue or Nezuna, and rarely at the same time), and it was easy to keep yourself invested in all the characters because they would have a sensible setting for their shenanigans. For those who gripe about the loss of the original cast, that's a silly gripe to have because the original Working!!! 's crew told a complete story. They're done. Any more with them and it'd just be awkward. If you miss them so much, watch the old series again! It's still there and it's still funny! Continuing the series with a different crew just makes sense. However, this crew could use some pruning. It's just far too many characters to try and get invested in. In a show that's only 23 minutes long, the amount of time each character has on screen is minuscule. The jokes are certainly more rushed and don't get the same kind of build-up. I have no doubt that we'll start to get attached to the characters as this series goes on, but there's GOT to be some boiling down, because part of Working!!! 's charm was that the cast actively tried to outgrow their wacky quirks. This crew... doesn't. Maybe the main pairing will, but it seems like the majority of them are going to stay static. There's just too big of a cast all trying to get laughs from you, and if it stays this overwhelming (Because frankly I can't even now, 5 minutes after seeing the first episode, even REMEMBER all the characters), it won't be a truly worthy successor to the Wagnaria pedigree. Don't get me wrong, if you loved the original run, you'll love this too. It's still Wagnaria at its core... but unless it starts juggling this massive cast better, it's just going to end up in its big brother's shadow, and that's a shame. If nothing else, this is a great excuse to go back and binge watch all 3 seasons of Working!!! again! I know a lot of people are excited about this release because its a continuing franchise (sorta) but my perspective is coming from someone who has never seen the show before. My impressions from Ep. 1 is that this show is really taking its time building. I generally dislike the more structured cast introductions where they introduce every single person with a few lines and their names posted next to them - it feels like a very lazy way to present the story and generally makes it difficult to keep everyone straight compared to a more organic presentation of the cast. The second half of the show starts picking up with some actual interactions between the characters but it also moved SUPER fast between scenes (and I mean, the first episode literally takes place over 2 weeks, which are presented as taking place in 3 seconds). The pacing overall just feels really off in this first episode. Talking about some of the positives, there were some genuinely funny moments, especially the final scene with the Valentine's chocolate, and the dad-humor of the dad cracked me up on multiple occasions. Each of the characters seem to be unique enough that there will be a lot of material for episodes so overall I feel the show has promise even if initially I was turned off. Hopeful more of those things that worked (the little jokes) will happen while the overall pacing of the story smoothens out. Although a little disappointed with the lack of familiar faces the insanity of comes at you in spades. Fun story with lots of laughs upcoming to be sure. As usual the jokes keep coming, the MC and his family is going to be just as amusing as the the last. Looking forward to more! After watching the first episode I think this series has great potential. I have read a lot of reviews comparing it to the original but I have not seen that version of the show. I hope this series can maintain the level of comedy and fun throughout the entire series. Here's Hoping. So far, so good. So lets see where it goes!!!! While the intro to characters feels a bit jumped or sped up, so far this is meeting the Wagnaria craving i had. Viewers do need to understand different cast different dynamics different story. So far it has fallen directly into a slice of life category with out revealing where to much of the plot is headed to.